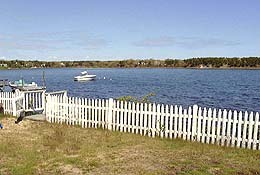 Tom Thumb Cottage on the shores of Grand Cove in South Dennis. 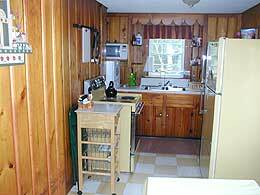 The cottage offers an unobstructed view of this salt water cove, complete with its beautiful sunsets. Plus, the cottage has all that makes Cape Cod special... wonderful water views, traditional knotty pine interior, two second floor bedrooms, full eat-in kitchen, full bath, and a gas fireplace for those cozy after sunset evenings. Tom Thumb is well suited for a family vacation/reunion or for two couples, and is close to all that the Cape has to offer. It's within walking distance to restaurants and shops, or a short drive to area beaches and attractions. Boating and kayaking is available near by, as are theaters and mini-golf. So, we're sure you'll enjoy staying at our little piece of Cape Cod, as much as we'll enjoy sharing it with you. Please call or email soon to reserve the weeks of your choice, and plan on a wonderful vacation at the Tom Thumb cottage. Step into the back yard and enjoy Grand Cove. Fishing, swimming, kayaking, sailing, boating. This is a no wake zone. On the other side of the fence is a 185'pier with boat dock. Beds: Master bedroom has queen bed w/ TV and A/C. room has queen size sleeper sofa and a/c. Approaching Cape Cod, follow the signs to the Sagamore Bridge. Cross the bridge and follow Route 6 (Mid-Cape Highway) to exit 9-A. This will put you onto Route 134. Follow Route 134 for approximately 2 miles to the intersection of Route 28. Take a right onto Route 28 and go about 4/10 mile and take a right onto Old Main Street (there will be a Martin-Surette Realty on the right). Go just a short distance to 21 Old Main Street(rear), and the driveway will be on your left. 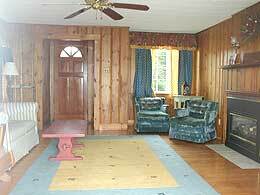 Tom Thumb cottage will be directly ahead and your vacation is about to begin.